On September 8th Body Harmonics hosted its first Teacher Training Open House in Toronto—a chance to meet teacher trainers, learn more about the teacher training program, even take classes and get up close and personal with Margot McKinnon, founder of Body Harmonics and Director of Body Harmonics Teacher Training. We had a wonderful mix of new and experienced teachers, several staff and faculty members, and even a group of Brazilian instructors who were attending a week-long immersion program of Body Harmonics workshops (yes, they travelled all the way to Toronto to take our teacher training!). All met, mingled and made new friends. In typical Body Harmonics fashion, there was a lot going on! We had springboard classes, reformer classes, props, clothes and manuals for sale, information sessions on the ins and outs of our teacher training program and, of course, a healthy snack table that drew people together to chat and network. Also new for her was the idea that while Springboard is included in the Cadillac, Chair Springboard and Barrels diploma training, there is also a separate workshop called Springboard Repertoire where teachers learn exercises and how to build Springboard classes over a three-day weekend. This workshop is offered in August 2018. Others were excited to try a Reformer class. One teacher brought her partner who has worked as a manual therapist but is thinking of a career change. He was familiar with mat work. After trying the Reformer for the first time, though, he told us that he was interested in taking both the Mat and Reformer training in the new year. He was particularly drawn to the idea that he had the choice of taking both the Mat and Reformer training in a modular or express format. Because he is anxious to get going, he was partial to the express version. Regardless of the format, the content is the same. In the express version, the Mat training is 8 consecutive days and the Reformer training is 11 consecutive days. In the modular approach, the training takes place over 4 weekends with a week or two between each session. Both versions work well. It’s a matter of what works best for each person. The information sessions drew a mix of new and experienced teachers. There were two sessions, one covering the Comprehensive Track and the other focusing on specialization diplomas. 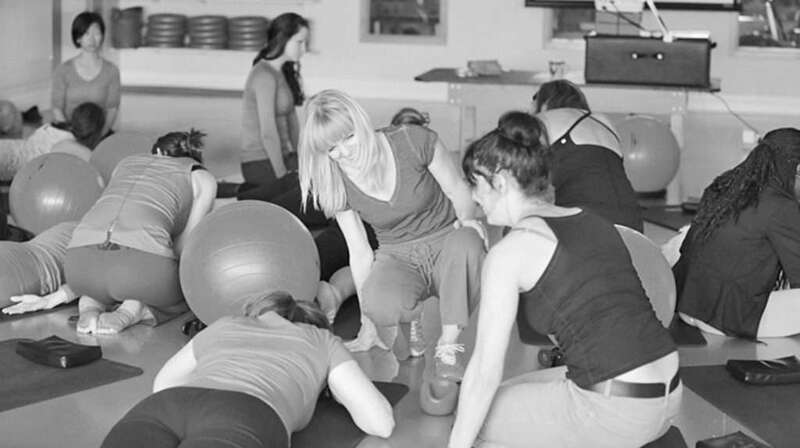 The session on the Comprehensive Track focused on where to start to become a Pilates teacher and how to progress from Level 1 Mat through to Level 2 Reformer and on to Level 3 Cadillac Chair Springboard and Barrels. Many were curious about how easy it is to get work after the training. Because we keep tabs on the market we know that equipment training really makes a difference. Going beyond Mat training increases the chances of getting work and deepens the knowledge base to work from. It’s definitely worth the investment when the time is right. The second session was designed to answer those questions! Currently, there are three specialist diplomas—Anatomy and Biomechanics, Rehab Protocols and Diverse Populations (for example seniors, pregnant women, athletes). Each specialization has a series of required and elective workshops totalling 125 hours of training related to that particular area of interest. We know from experience that people really appreciate the way the specialist diplomas map out a logical training path over time. At 7pm we all gathered to hear Margot speak. She talked about the power of simplicity and told three stories to illustrate how being focused and keeping things simple can help develop competence and confidence. The first story was about Nelsia, an experienced teacher from outside Winnipeg in Manitoba. Nelsia travels to Body Harmonics once a year for her “teacher training tune-up.” It so happens that this year’s visit coincided with the open house so she was in the audience! Before she arrived, Nelsia told Margot that she wanted to do the Ethical Touch workshop. When it came time to meet, Margot played client so Nelsia could teach her and learn when and how to apply touch in the context of a client session. This was exactly what Nelsia needed! It wasn’t so much about learning techniques as building her confidence and competence in a practical way. The second story was about how Margot learned to ski. She learned as an adult because her husband and his family all skied. She decided to take lessons. The instructor peppered her with all kinds of technical information to the point where Margot felt overwhelmed! The ski school convinced her to try another instructor. This instructor just had her follow her down the hill. The difference in learning and comfort was amazing! This instructor kept it simple, only adding information as needed and when Margot was ready to integrate it. She felt successful and wanted to do more! With each pass she gained confidence and fine-tuned her skill in the process. The last story was about Margot’s training as a Pilates teacher. When she trained it was under the auspices of the Physical Mind Institute. There were no teacher training materials and few if any resources. There was no training about how to become a good teacher. Instead she was told it would take years to become an successful instructor—with no guidance to help her build her competence and confidence. Convinced that it doesn’t have to be that way, she resolved to do things differently at Body Harmonics—both in the studio and Teacher Training program. With that as a backdrop, the guiding principle for the Body Harmonics Teacher Training program is and always will be: What do people need to succeed? Keeping things simple, relevant, practical and focused, giving people the information they need when they need it, and providing support every step of the way: those are the necessary ingredients, the key to building confidence and competence—in everyone, client and teacher alike. From there, participants were invited to submit any questions about Teacher Training, the process, content, anything. Margot committed to answer each and every question in one way or another in the near future—as simply as possible!